All regional NRM organisations deliver actions to improve the health of waterways and most include water in their regional planning. Regional NRM organisations are also becoming increasingly important in the management of Environmental Water Reserves. In some States they are the body that develops Annual Watering Plans around climate scenarios, working with Water Corporations to deliver environmental water to priority sites, and undertaking long-term intervention monitoring programs. The maturity of this model is now seeing water planning occurring across catchment boundaries and ultimately State boundaries. In addition to these major initiatives, all regional NRM organisations support local projects designed to improve the health of rivers, wetlands and floodplains within their regions. Regional NRM organisations are important partners in the development of water planning processes across Australia, particularly in Victoria, NSW, SA and Qld. This is due to their knowledge and skills around environmental water, on-farm water use, river health, sustainable irrigation practices, and community and stakeholder partnerships. The Caring for the Campaspe project is the first large scale on-ground works project to deliver river health improvements for the Campaspe River from its headwaters near Ashbourne to the Murray River at Echuca. The Campaspe River contains several threatened vegetation communities, aquatic life and provides habitat for many terrestrial species, such as the threatened Swift Parrot and Squirrel Glider. The overall goal of Caring for the Campaspe, funded by the Victorian Government through the Regional Riparian Action Plan, is to improve the condition of riparian vegetation leading to improvements in the aquatic and riparian ecosystem health of the Campaspe River and build strong working relationships with landholders. Since 2012, the North Central CMA has been providing fencing, offstream watering, weed control and revegetation incentives with interested land managers on both public and privately owned along the river’s length. The particularly complements the delivery of environmental flows downstream of Lake Eppalock. 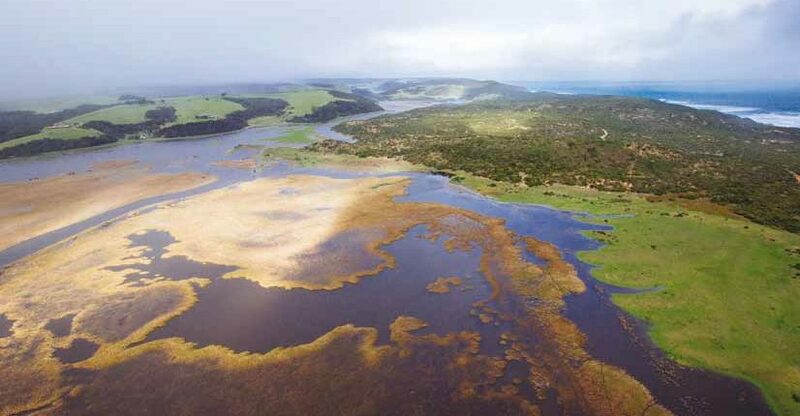 The Corangamite Floodplain Management Strategy outlines how the ecological and cultural values of the natural floodplains can be protected while also managing the risks to life, property and assets associated with flooding. In the Corangamite region, many authorities work together to help protect and support communities affected by flooding. These include federal and state government agencies, local government authorities, the Corangamite Catchment Management Authority, Traditional Owners and emergency services. The Tuggerah Lakes estuary located on the NSW central coast is a unique environment that is home to a rich variety of wildlife and vegetation such as saltmarsh and freshwater wetlands. Over the last 30 years the estuary has been affected by human activities resulting in nearly half of the wetlands being lost due to development, and stormwater runoff delivering nutrients and sediment to those that remain. In 2006, Wyong Shire Council developed the Tuggerah Lakes Estuary Management Plan to help manage the estuary and received a $20 million grant from the Australian Government’s Caring for our Country to deliver improved water quality. In 2011, the Hunter-Central Rivers Catchment Management Authority CMA partnered with Wyong Shire Council through a $1 million program designed to help landholders protect and rehabilitate native vegetation and improve land management practices in the Tuggerah Lakes catchment. The program resulted in 47 practical projects that included planting of native plants, rehabilitation of riparian and wetland areas, control of Weeds of National Significance (WoNS) and stock exclusion fencing of riparian areas. The CMA reached 297 land holders through capacity building workshops in areas such as weed identification and field days to engage the community and provide skills in sustainable land management. Over 15 media releases resulting in 30 stories about projects were published in the local press and radio. “Protection of vegetation on our property has given us the opportunity to provide a secure healing sanctuary for the participants in our Bridge program.” Jeanette Stoltenberg – Salvation Army Dooralong Transformation Centre. One area in which Regional NRM organisations are leading the way that supports future water reform processes is in engaging with Traditional Owners and Indigenous land managers, by incorporating traditional ecological knowledge and an understanding the value of cultural water. Most Regional NRM organisations now have Indigenous Participation Plans or equivalent, driving regular and meaningful engagement with Traditional Owners, and working to include Indigenous ecological knowledge in integrated catchment (land and water) planning. It is important to recognise in future water reform that Traditional Owners are not only seeking to influence and control decision making around cultural water, but are also seeking their rights to water to drive social enterprise opportunities achieving economic outcomes. The Budj Bim National Heritage Landscape is a section of volcanic plain that encompasses the area from Mt Eccles to the sea. The basalt lava flow created a series of wetlands and rivers including Lake Condah, Darlot Creek and Fitzroy River and estuary. The project is pioneering a new state-wide approach for tracking progress and reporting back to communities, using citizen science as part of this. The new approach will help to better demonstrate the social, cultural, economic and environmental benefits for communities. The Budj Bim landscape is sacred to the Gunditjmara and this project is working with Traditional Owners, farmers and the community to improve the condition of native vegetation, connectivity and foster sharing and integration of Aboriginal knowledge. Myora Springs (also known as Campembah Creek), on the north-west side of North Stradbroke Island, is known for its natural beauty as well as a site of cultural significance to the Quandamooka people. It is a freshwater spring directly adjoining both remnant coastal rainforest to one side and mangrove communities on the other and it is a popular water hole and educational resource. Endangered flora and fauna such as the vulnerable water mouse (Xeromys myoides ) and endangered colourful Swamp Orchid (Phaius australis) are residents here and the Quandamooka people have strong ties to this site, a favoured camping and meeting place. 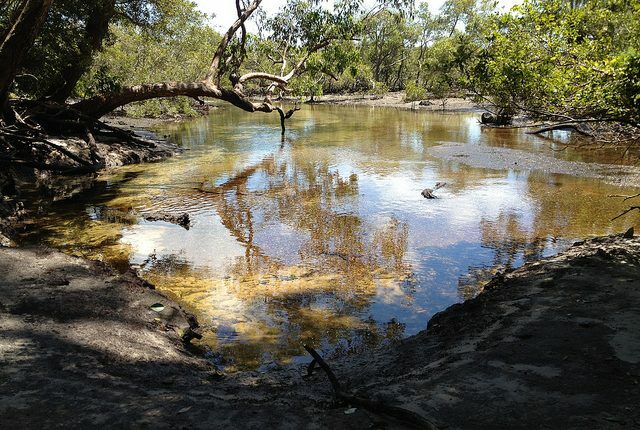 In 2012, South East Queensland Catchments – with funding from the Australian Government – along with partners OceanWatch Australia, Wetlandcare Australia, Healthy Waterways, Redland City Council, and the Quandamooka Yoolooburrabee Aboriginal Corporation identified a need to control the unintentional erosion and a loss of vegetation, including mangrove dieback, arising from increased human traffic from visitors, to preserve this unique place for future generations. The Quandamooka people were keen for this unique ecosystem to continue to be shared and enjoyed by the local community and tourists alike. The primary objective was to restore and stabilise where serious erosion had already occurred, including installation of geofab structures, removal of 40 tonnes of gravel impacting the waterway from nearby and revegetation. An environmentally sensitive designed walkway and viewing platform was also built to help minimise further erosion as well provide an opportunity to raise awareness about the values of the site. Without these works, the erosion effects would have been compounded by the storms in January 2013, with more sediment and mud washed away into the spring and Moreton Bay. The works have so far proved to be very successful in preventing any further erosion. The purpose of the Aboriginal Waterways Assessment (AWA) program was to develop a tool that consistently measures and prioritises river and wetland health so that Traditional Owners can more effectively participate in water planning and management in the Basin. Since the development of the AWA it has been implemented by Traditional Owners in the ACT, SA, Queensland and Victoria.